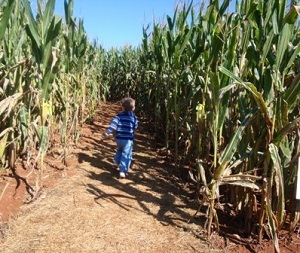 Find local corn mazes and hay rides in every state in the U.S., Canada, Britain and other countries. I'm always looking for more to add, so if you encounter any, please email me! So if you have any to add or corrections please let me know! Also help me rate them! Zombie paintball is the latest zombie craze. See this page for a description and to find a zombie paintball event near you. If you want to see a local weigh-off for the largest, giant pumpkin, see this page! And be sure to tell them you found their farm here - When the farmers or maze operators hear that visitors are finding the farm on this website, that encourages them to keep their information up to date - and it is free, so there's no reason not to! There is a "Start here" button (at the top of the left of every page). You then select your local area (country, state/province) and then region/county or local metropolitan area. Just scroll down the page that appears, to see tree farms, lots or events listed by county. The search engine can be helpful, too. Click on your state or country below to find pumpkin patches in your area! Pumpkin Patches Outside the U.S.
[ Australia ] [ Canada ] [ Germany ] [Ireland] [Italy] [Japan] [Malta] [Nederland / Holland / the Netherlands] [ South Africa ] [ New Zealand ] [Philippines ] [Switzerland ] [ United Kingdom ] [ Adding a Farm outside of North America ] Looking for mazes in other countries? Living in another country, such as France, Italy (Italia), Germany (Deutschland), Nederlands, or Sweden? Help me compile a list for your country - just write me! Want to find out when your favorite crop will be ready to harvest in your local area? Just go to this page and click on your state, to see the crop calendar for your area! How to grow your own pumpkins! Can't get a real pumpkin? Try carving a virtual pumpkin! Our listings come from a variety of sources: consumers writing in to recommend a farm, the farmer's themselves and state agriculture departments. We update and add listings every day. Of course, we're always looking for more to add, so we welcome your recommendations! Customers can recommend a farm here and farmers can add (or update/correct) their own farm's listing by clicking here! And journalists looking for information for a story about pick-your-own farms or home canning should see this media resources page for more information. Want to start your own seedlings and save a fortune? See this page to learn how to save 95% off the cost of starting your own vegetable and flower plants. Preppers will find this page of home food preservation for preppers useful! I also post crop updates, trends, tips and commentary via Twitter . Just go to http://twitter.com/home and if you haven't got an account, sign up (they're free), then search for Blakepyo. I tend to send out only one or two per week, so it shouldn't be too much! You can sign up for our RSS feed here! This page, http://www.pickyourown.org/resources4farmers.htm, has loads of information and links to resources that will be helpful to farmers. For those who are considering starting a PYO farm, corn maze, pumpkin patch, Christmas tree farm or other agri-entertainment business, see this page: http://www.pickyourown.org/howtostartapyo.htm. Curious about the guy behind the website? See About me.